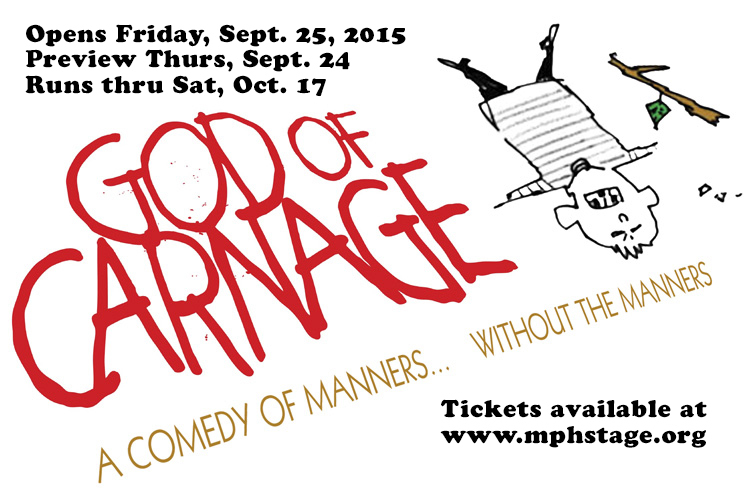 Modjeska Playhouse’s second season opens Friday, Sept. 25, with Yasmina Reza’s comedy, God of Carnage. Winner of the 2009 Tony Award for Best Play, God of Carnage, written by Yasmina Reza, finds two sets of Brooklyn parents meeting to resolve the matter of a playground altercation between their eleven-year-old boys. At first, diplomatic niceties are observed, but as the meeting progresses, and the rum flows, tensions emerge and the gloves come off, leaving the couples with more than just their liberal principles in tatters. “[A] streamlined anatomy of the human animal…delivers the cathartic release of watching other people’s marriages go boom. A study in the tension between civilized surface and savage instinct, this play is itself a satisfyingly primitive entertainment.” — NY Times. “Elegant, acerbic and entertainingly fueled on pure bile. It’s Reza’s sharpest work since ‘Art’.” — Variety. “Brutally entertaining…in another of Christopher Hampton’s exquisite translations, [Reza] cannily manipulates social observations that appeal to vast audiences and creates characters that bring out the best in actors.” — NY Newsday. “Reza has established herself as a master [of] magnificently constructed plays.” — Entertainment Weekly. Times: Thurs-Sat at 8 p.m., Sundays at 5 p.m.
For tickets and info, visit www.mphstage.org/tickets.